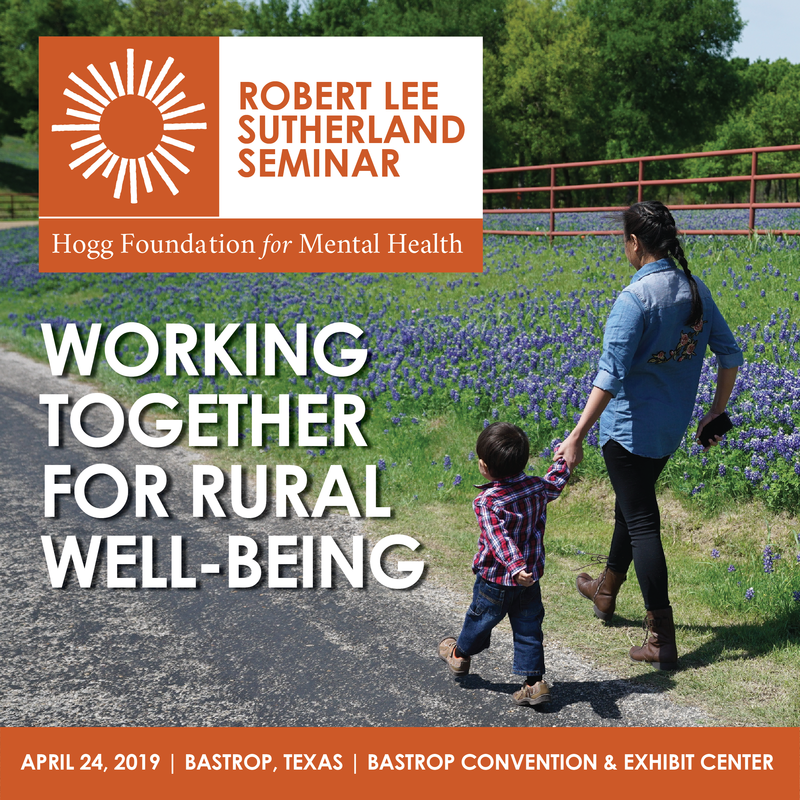 Named after the Hogg Foundation’s first executive director, Dr. Robert Lee Sutherland, this biennial event offers a chance for Texans to reflect on critical issues in mental health and promote innovation and collaboration among consumers, providers and advocates. Since 1978, the foundation has convened these seminars to increase awareness about complex mental health concepts, such as recovery, integrated health, and barriers to well-being. Join us on April 24, 2019, 7:30 AM to 4:30 PM, at the Bastrop Convention & Exhibit Center (1408 Chestnut St, Bastrop, TX 78602)! Admission is free. With a theme born out of the foundation’s mission to transform how communities promote mental health in everyday life, the 2019 seminar is open to all who are interested in community-based approaches to addressing resilience, mental health and well-being in rural communities. Registration is closed. This event is at capacity and has a waitlist. As openings become available, waitlisted individuals will be informed in the order in which they joined the waitlist. If you registered and your plans have changed, please inform us at your earliest convenience. Thank you! With little exception, the foundation has hosted Robert Lee Sutherland (RLS) Seminars every two years since 1978. Keynoted by First Lady Rosalynn Carter, the inaugural seminar brought more than 1,000 people together to examine the implications of the U.S. President’s Commission on Mental Health Report for the people of Texas. Each seminar features a different theme based on the landscape of mental health in Texas at the time of the event. Check out seminar themes from past years, below. Defined by the Substance Abuse and Mental Health Services Administration as “a process of change through which individuals improve their health and wellness, live a self-directed life, and strive to reach their full potential,” mental health recovery is one of the most important aims of behavioral health services and is transforming current standards of practice. This seminar offered knowledge of the impact spirituality has on African American mental health, increased awareness of existing community-based strategies, and facilitated networking among key regional stakeholders. This seminar established a common knowledge base and dialogue about mental health, recovery and wellness and offered perspectives from mental health consumers, youth and their families. This seminar convened the knowledge and experience of more than 50 national, state and local physical and behavioral health care experts, providers and consumers with experience in systematically coordinating physical and behavioral health care. The seminar provided education and dialogue on cultural competence and evidence-based practices, and promoted linguistically- and culturally-appropriate treatment, training and education practices. The seminar began building a common language and a data collection framework to better implement federal restraints and seclusion standards within the context of quality service provision in Texas. This seminar promoted coordination and collaboration of juvenile justice agencies, local and state law enforcement, mental health officials and community members in effectively identifying, treating and supervising juvenile offenders with severe emotional disturbances. This seminar focused on identifying the most pressing mental health needs facing ethnic and racial minorities in Texas, and offered solutions that helped shape the foundation’s minority mental health initiative to improve access to quality services and impacted public policy. This seminar convened Houstonians to encourage the collaborative design, funding and implementation of a model program for children’s mental health that could be replicated in other urban centers. The Greater Houston Collaborative for Children, a major funding alliance, grew out of this seminar. This seminar convened a diverse group of experts from Texas and Mexico to discuss adapting various psychiatric and diagnostic instruments for use in the border region. This seminar offered information about the nature and effectiveness of school-linked mental health services, policy implementation of such programs, and future prospects for parents and teachers to participate in related education reform. In connection with the foundation’s 50th anniversary, this seminar brought together researchers from across the state with the goals of highlighting the best Texas has to offer in advancing scientific frontiers in the field of mental health. This seminar featured delegates from around the state who participated in four task groups to review and discuss the activities and concerns of the foundation’s Commission on Community Care of the Mentally Ill. This seminar focused on the incidence and prevalence of mental health challenges and associated risk factors among people of Mexican origin. Available prevention and treatment programs were discussed, as well as the impact of economics and political decision-making processes related to mental health services for this population. Participants commemorated Miss Ima Hogg’s birthday and her contributions to mental health services for children and families in Houston by discussing the needs of underserved children with mental health challenges and/or intellectual or developmental disabilities. This seminar focused on how the private and public sectors can better help one another meet their common goals. It examined effective roles for foundations in mobilizing grass roots support for mental health planning and evaluated roles for the private sector in the area of mental health.